Palm Canyon Press, 2014. 234 pages. 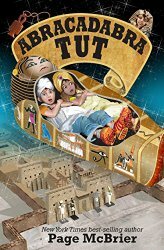 Abracadabra Tut is a fun time-travel story, taking two kids back to Ancient Egypt where they get to meet King Tut. Fletcher is a magician in middle school with a birthday party business and dreams of greater things. He goes to an estate sale for a famous professional magician and sees many things he would love to have – but his attention is especially caught by an actual mummy’s coffin. He talks with a woman at the auction about the mummy’s coffin. She seems impressed with his knowledge of ancient Egyptian magic, which he’s read a book about. But he’s not prepared when a mysterious benefactor – named Isis – purchases the mummy’s coffin by bidding online and gives it to Fletcher. When the head of the Spirit Committee at school, Arielle Torres, hears that Fletcher got an actual mummy’s coffin, she asks him to do a magic show during the break at the end-of-the-school-year dance in two weeks. And she wants to be his assistant. But she can’t be bothered to practice, and when the show takes place, everything that can go wrong does go wrong – until they both get into the coffin, and it transports them to Egypt during the time of King Tut. In Egypt, Fletcher uses a little stage magic to impress the crowd and keep from getting killed. But then King Tut decides that Fletcher’s magic gives him luck and protects him, and Fletcher’s worried. Because he knows King Tut died when he was not much older than the king Fletcher has just met. What will happen when his luck runs out? And if someone in the court is trying to kill the king, will they kill Fletcher? And how can Fletcher and Arielle find the coffin and get back home while they’re still alive? This book is mostly light-hearted fun, but it does throw in some facts and history about ancient Egypt. There’s adventure and humor and two kids trying to do something good when they may be out of their depth.